Scotland assistant coach Gregor Townsend insists the 40-man World Cup training squad have it all to play for ahead of the final decision over who will travel to New Zealand as part of their final 30-man party. The Scottish national side endured a torrid Six Nations campaign finishing fifth and winning just one game. However, they used the opportunity to rotate their half-backs and centres in a bid to find the perfect combination ahead of the World Cup. Andy Robinson has recently stated he already knows 25 of the 30 players going on the plane to New Zealand but at scrum-half, Robinson still has a key decision to make over who starts against Romania on September 10. Gloucester's scrum-half Rory Lawson started four of the five Six Nations games but with British & Irish Lion Chris Cusiter back in the fold and 71-cap Mike Blair banging at the door, Lawson is by no means certain of his place in the starting XV. "Everyone knows the squad will be cut down so no one is guaranteed their place or know they are going," Townsend said. "As coaches we do know our core group but the players have trained very hard and are all desperate to get in that final 30. "We have more inter-squad training and two very important games against Ireland and Italy so players will have a chance to put their hand up there. We were pleased with a lot of aspects of the Six Nations. Some of the attack play was great and it was where we wanted to be. "Cusiter missed out through injury but he's back close to 100% so we have another quality scrum-half in the mix so it's a good situation to be in with everyone pushing as hard as they can to get in that starting line-up." While the scrum-half berth is still up for grabs, the two centre spots are also still available. Sean Lamont made a late charge for the World Cup centre berth impressing against Ireland, England and France during the Six Nations. "We have changed our centres this year," Townsend said. "Lamont moved into the centre for the last three games and was great there - a revelation - so that's added another player to the mix. "Graeme Morrison has been great in the past but missed the past Six Nations through injury. The likes of Max Evans, Joe Ansbro and Nick de Luca mean we have quality players there and they know they have to play well to keep their position in the team and must fight to get into the side." Townsend, who played the last of his 82 Tests for Scotland against Australia in the 2003 World Cup, is looking for his centres to "express themselves." Townsend believes the law interpretations, which he perceives to favour the attacking side, will pay dividends for those sides that are keen on taking risks. "We want the outside backs to express themselves," Townsend said. "If you can beat a man and find space and offload or cause a line break then the new law interpretation will make it hard for the defence to stop you whether it's three points or a try. "It's great watching the likes of Sonny Bill Williams causing damage out there. I think players over the last year, because of the new law interpretations, have taken more risks. This is due to the fact that they know they won't get isolated in support as the tackler has to let them go meaning you should keep the ball for another phase at least." Scotland face Ireland on August 6 at Murrayfield and Italy on August 20 before opening their World Cup campaign against Romania in Invercargill on September 10. 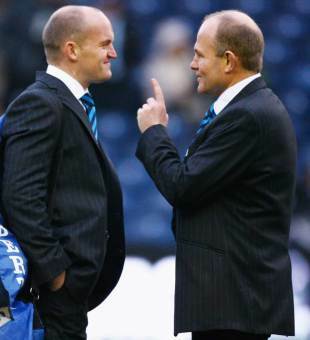 Get inside the game now with Gregor Townsend at www.therugbysite.com. The Rugby Site is a new website for the rugby community to learn from the game's top players and coaches and improve their skills, as well as share experiences. The Rugby Site team also includes players and coaches such as Richie McCaw, Dan Carter, Bismarck du Plessis, Victor Matfield, Wayne Smith and Graham Henry.